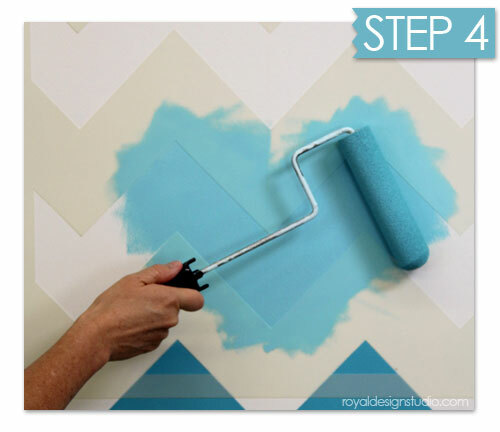 This stencil tutorial combines two hot trends-chevron stripes and an ombré paint finish to create a gradated shades of gorgeous teal for a one-of-a-kind stenciled feature wall. 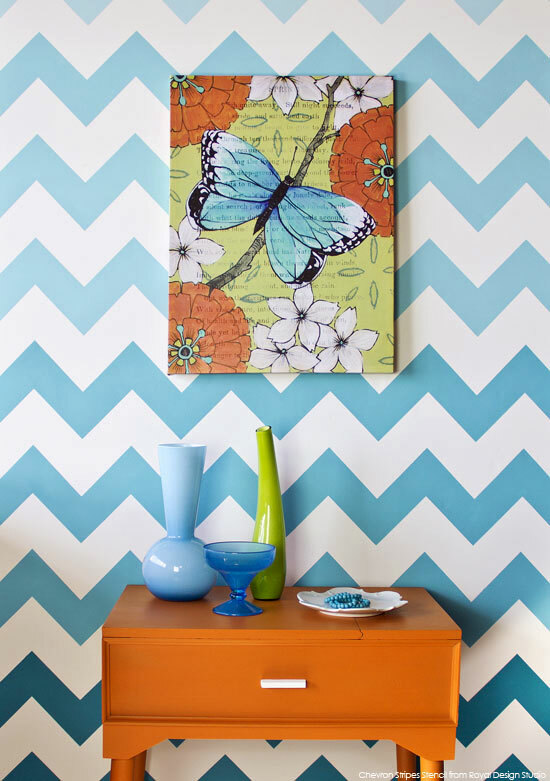 Using a large Chevron Stripe wall stencil from our Modern Stencils Collection makes easy work of creating a zig-zag chevron pattern. 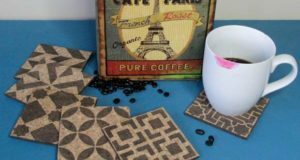 We also have some tips to make your roller stenciling clean and crispy (as opposed to messy and drippy)-so read on and let’s get stenciling! We’ve found that the Behr Premium Plus paint from Home Depot to be some of the BEST paint for stenciling with a roller. Why? It’s a paint and primer combination and has excellent opacity, coverage, dries quickly, and is a heavier bodied paint-which all helps add up to roller stenciling success. Ombré is a French word meaning “to shade”. 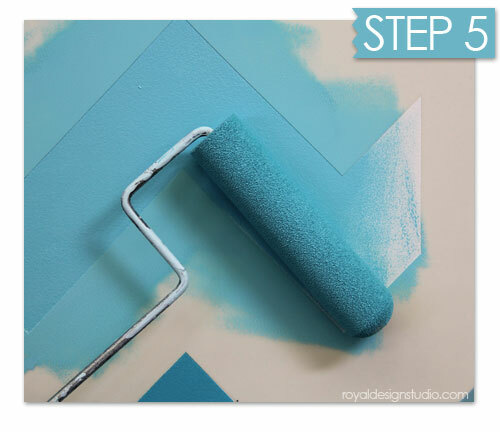 For our project we chose 4 shades of a teal blue color from the same paint chip range-skipping every other color to keep the same color vibe, but with enough difference to really matter. If you want a more subdued ombré chevron wall treatment, use neutral colors and choose side-by-side colors. You could even start with a version of that same shade as your background color. Hold the can about 10″ away from the stencil and just give it a light, even misting. 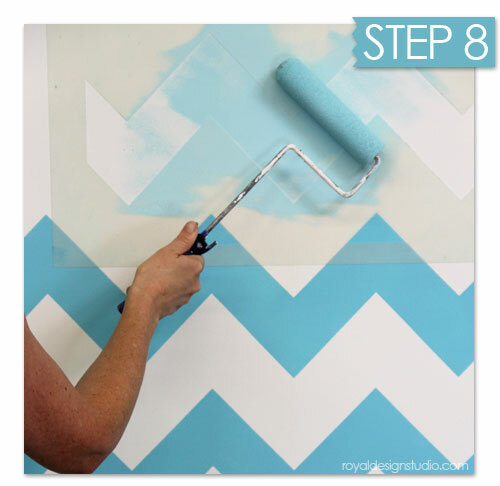 Allow the adhesive to “set up” on the stencil for a minute or two before affixing to the wall. It’s difficult to remove all spray adhesive from the stencil after using, BUT if you soak the stencil in a Simple Green “bath” for a day or two, it will just slide off-along with the paint. 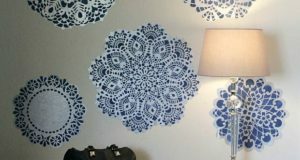 Step 2: Place the stencil on the wall and check that it’s level and lining up with any previous stencil repeats. Because of the amount of mylar removed with pattern, this stencil has a lot of “flex” to it, so be patient when aligning it to get it nice and smooth and flat on the wall. 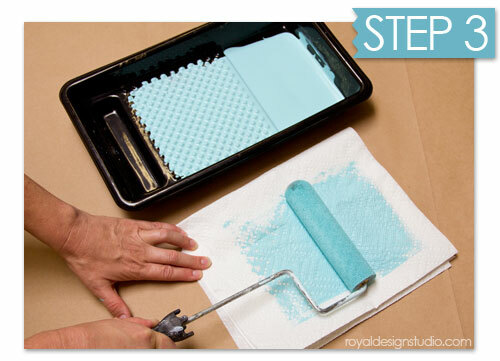 Step 3: Load the Flocked Foam Stencil Roller evenly with paint in a proper paint tray and remove excess paint by rolling over a stack of paper towels or absorbent paper. It’s important to have the paint evenly loaded on the roller and not have too much paint-which will naturally seep under the stencil. The Flocked Foam Stencil Roller is covered with a thin velour fabric coating-which helps resist those paint run unders, but if you have TOO much paint…..well, you’ll see….seriously-practice! Step 4: Use an even, steady, not-to-heavy pressure on the roller as you roll over the stencil surface. This paint DOES cover very well-and quickly, but take some time to go slow at first to get used to how much paint and pressure you need to get a great stencil print. 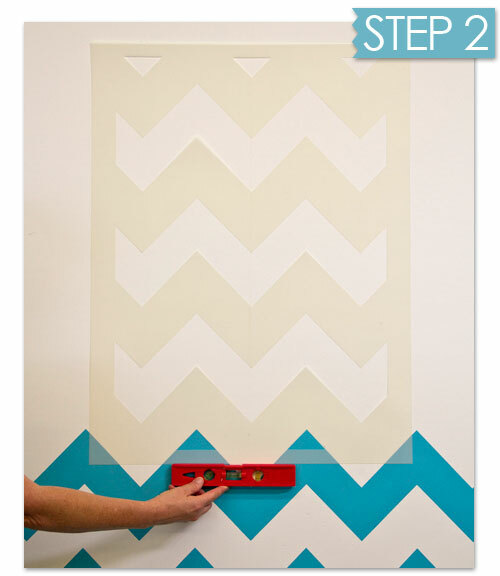 Step 5: The Chevron Wall Stencil has built in registration that is a little different from our other wall stencils. The stencil comes with illustrated instructions, but basically, the zig zag stripes on each end overlap a little bit. As you are stenciling-stop short and fade out the paint towards the end….. Step 6: After you move the stencil to the right (or left) you will overlap the stencil on the previous area and pick up the pattern again. The reason to fade out and fade in with the paint, is so you don’t build up a noticeable line of paint down your zigzags stripes at the stopping and starting point. NOTE: IF you are offloading your stencil roller correctly, the paint from your last repeat will be dry enough that there is no issue in laying the stencil over it. Step 8: For our 8′ high wall, we found that doing three stripes of each of the 4 colors fit perfectly and created just the right amount of ombré! 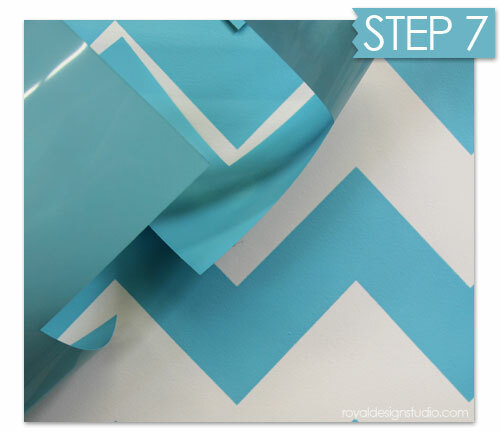 When moving the stencil pattern vertically, you will find it easy to line up by simply matching up the cut out triangles right over your previous zigzags. 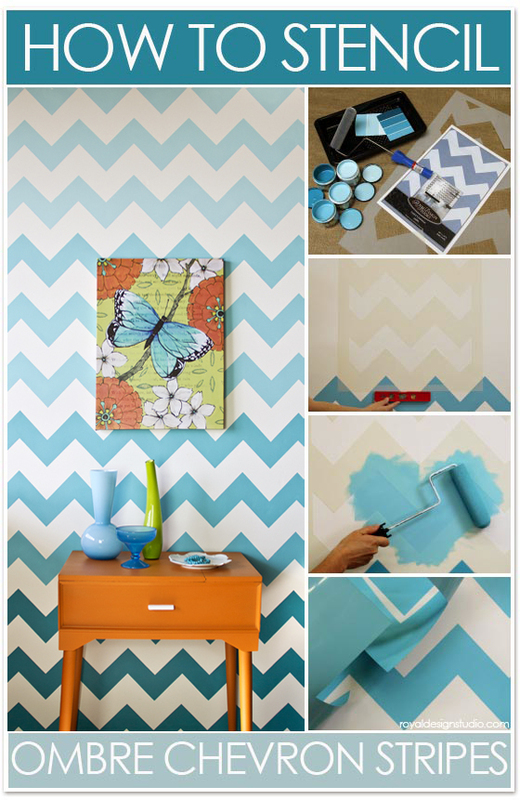 We think that this Chevron pattern is an IDEAL treatment for a stenciled feature wall. You can pick out one of the ombré color shades to paint a coordinating color on the other walls. 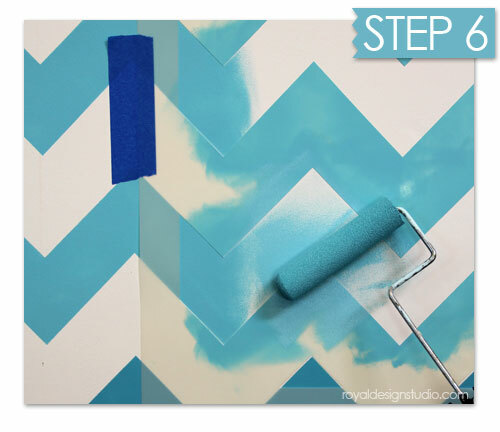 If you DO want to continue the pattern around the room, we recommend that you use the stencil simply as a tracing pattern at the corners, and then use tape in the corner to define the zigzag stripes there. Dress up your wall with some fun accents. We were lucky to find this cute Mid Century Modern table/sewing chest for free on the sidewalk and snazzed it up with a couple of coat of Barcelona Orange Chalk Paint™ from Annie Sloan. We also have a Chevron furniture stencil pattern perfectly sized for furniture, fabric, rug, and craft stencil project. ALL would look great with an ombré paint treatment. 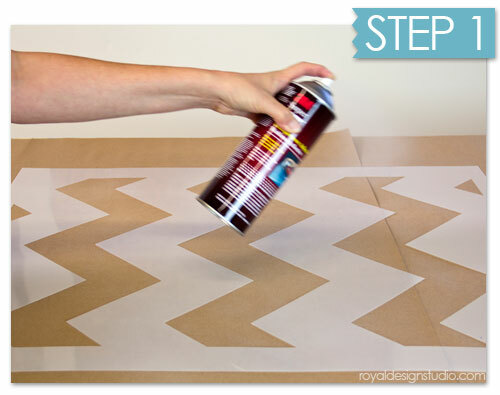 Have fun stenciling, and please share your projects with us! 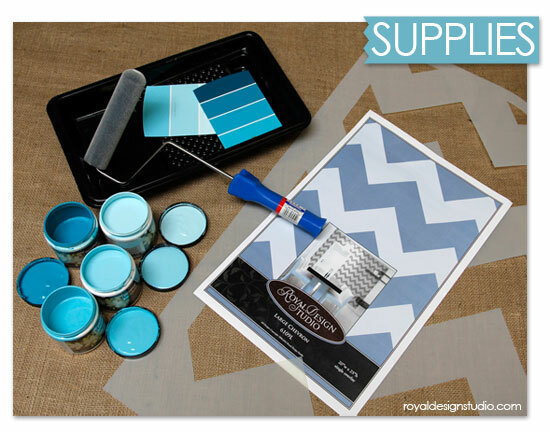 Want MORE paint and pattern in your life? Follow Royal Design Studio Stencils on Facebook for daily doses of stencil ideas and inspiration. 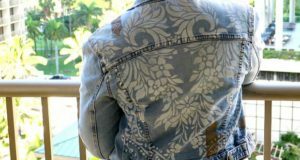 Check out our amazing Group Pinterest Board Pattern and More Pattern. 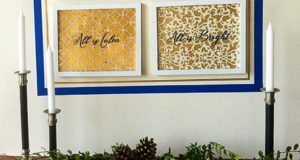 Follow our Stencil Ideas Blog for weekly posts of projects, news, and new stuff!